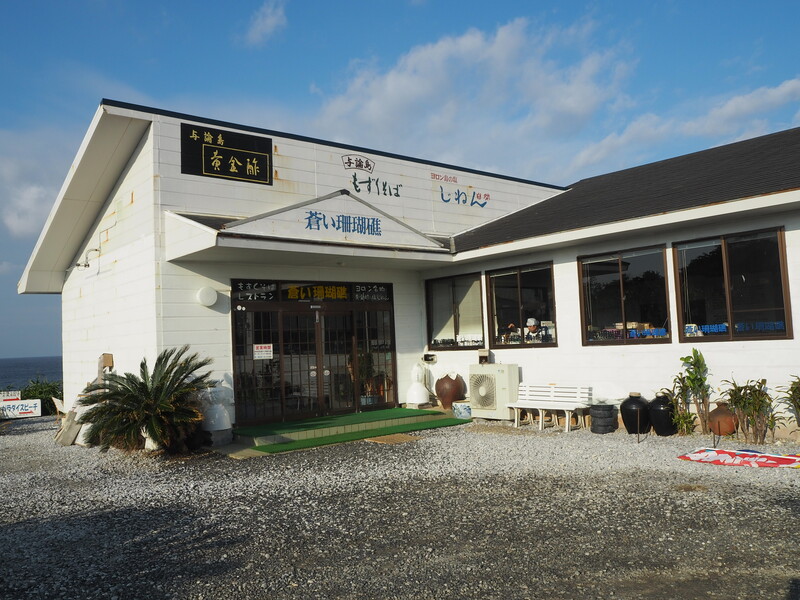 The specialty of Yoron Island (Yoron-jima) is mozuku seaweed, and most restaurants in Yoron Island serve various mozuku dishes. On this day, I visited a restaurant “Aoi Sangosho” to eat mozuku soba noodle for lunch. “Aoi Sangosho” is located near Yoron Airport. Go out the entrance of Yoron Airport, turn right and walk a little way, then turn left at the intersection with a small horse stable, and you will find the restaurant at the end of the street. There is a beautiful beach called Paradise Beach behind the restaurant. You can walk down to the beach using a stone stairway located on the back of the restaurant. The powder-fine sand and clear blue water of the beach are beautiful, one of the best in Yoron Island. It totally surprised me that such a beautiful beach exists on the back of a normal Japanese restaurant. This beach serves as an egg-laying site for sea turtles, and you can see the egg-laying during the period of early summer (around May to July). I entered the restaurant, sat at the table near the window with a view of Paradise Beach. The restaurant seems long-established, and it has the atmosphere of a small island’s rustic restaurant (the restaurant is quite spacious, though). They have various soba noodle menus, but all the soba noodles are made from mozuku. They don’t use buckwheat flour for Mozuku soba noodle (same as Okinawa soba noodle), instead they use wheat flour mixed with mozuku seaweed. They also have various menus such as Berkshire pig dumpling and “keihan,” a rice soup topped with chicken, shredded omelet, shiitake mushroom, which is a local specialty eaten in Amami Islands of Kagoshima Prefecture. I ordered a simple “Mozuku Soba” on this day. The appearance of mozuku soba noodle is same as that of normal Japanese soba noodle. It is topped with simmered pork and additional mozuku seaweed. Not only its appearance, but also its taste is similar to normal Japanese soba noodle eaten in the main island of Japan, rather than Okianwa soba noodle eaten in the islands of Okinawa. If not told, I couldn’t tell if it contains mozuku seaweed. My favorite noodle is Okinawa soba noodle, but mozuku soba noodle is also very tasty and I think it is healthier than Okinawa soba noodle (mozuku is known as a healthy food). After the lunch, I enjoyed having a cup of coffee while looking out at the sea. The coffee came with a homemade doughnut. I highly recommend you visit “Aoi Sangosho” and have a mozuku soba noodle while enjoying the beautiful view of Paradise Beach. You can also buy mozuku soba noodle for souvenir at the souvenir shop next to the restaurant. Enjoy the delicious specialty of Yoron Island! * Please note that the information above may be changed. ©Copyright2019 On The Run.All Rights Reserved.